President Rivlin meets with Ukrainian FM Klimkin, speaks about economic ties, tourism, and the joint battle against anti-Semitism. 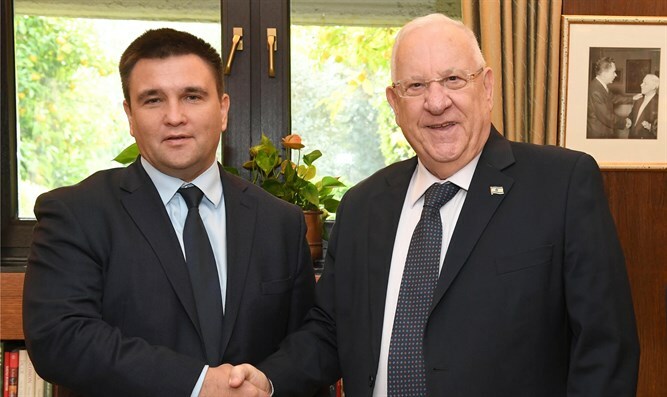 President Reuven Rivlin on Monday morning, held a working meeting at his residence with Ukraine Foreign Minister Pavlo Klimkin who was visiting Israel. In their meeting, the two discussed the strengthening ties between the two countries, and the importance of Ukraine's Jewish community as an important part of the Ukrainian people. Rivlin stressed that the State of Israel viewed with concern the phenomena of the rise in anti-Semitism around the world, and in Europe in particular. The two men discussed regional developments, and the evolving situation in Europe. Rivlin emphasized that he would continue to do everything in his power to deepen the ties between the two countries. Klimkin thanked the President for his warm welcome and stressed that the coexistence of Jews and Ukrainians for hundreds of years had created deep ties between the peoples. He recalled the deep impression he had from Rivlin's visit to Ukraine in September last year. Klimkin also spoke of the joint economic opportunities Israel and the Ukraine have, and of the flourishing tourism that he noted should continue to be developed. Rivlin assured him he would promote the issue with the relevant authorities in Israel.